We are pleased to offer 3 immigration pupillages, commencing in April 2017, September 2017 and September 2018. Richmond Chambers LLP is an award-winning innovative partnership of specialist immigration barristers. Practising from the heart of Covent Garden, our immigration barristers specialise in all aspects of personal and business immigration law. 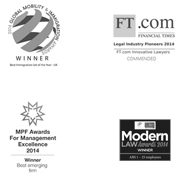 Our clients include individuals and businesses, within the UK and overseas. Established in 2013 as the first barrister-only ABS, our barristers share a core commitment to providing high quality immigration law advice and representation directly to members of the public. Chambers currently has 12 barrister members (of whom 4 completed pupillage in Chambers) and 2 pupils, supported by a team of 4 legal associates and 4 administrative staff. Further recruitment is planned throughout 2017 and 2018. Due to our unique structure, we are able to offer a traditional immigration law pupillage with the benefits of working in an employed setting. Direct client contact, significant responsibility from an early stage and regular supervision and training from experienced immigration barristers ensures that our pupils develop the core skills necessary to succeed at the Bar. Meanwhile, our pupils receive a regular salary and competitive benefits package, as well as the potential for continuing employment as a barrister in an innovative barrister-only law firm. We are a small progressive team, working at the frontline of a uniquely challenging and rewarding area of law. Our people are our greatest asset and we actively promote a professional, friendly and supportive environment in Chambers. Candidates are advised to read and consider our website and our selection criteria carefully when deciding whether or not to apply. Our pupillages are employed pupillages. You will be offered a 12 month contract with an annual salary of £25,000, paid monthly through a PAYE scheme for your pupillage year. Other benefits will include 20 days paid holiday (plus bank holidays), interest free travel loan, expenses (including your practising certificate fee), fully funded pupillage courses, a contribution towards CPD courses, and from June 2017, access to our Chambers pension scheme and other benefits in kind. We believe that training is best achieved through experience. During your first six, you will be exposed to a wide range of immigration applications, appeals and judicial reviews. From day one, you will be working alongside our barristers, assisting them with their cases. You will play an active role in all aspects of case preparation and presentation, including attending conferences, conducting legal research, drafting legal submissions and observing court hearings. You will be involved at every stage of the process and receive regular feedback on your work. In your second six, there will be opportunities to accept instructions from solicitors for hearings before the immigration tribunals. You will also be assigned your own clients and will assist them to relocate to, extend their stay and settle in the UK. If this sounds daunting, then don’t be put off from applying. The experience that you will have gained in your first six means that you will be well equipped to represent your own clients and supervision and support will continue throughout. We run an in-house advocacy training programme that will focus on practicing core advocacy skills and professional ethics in a friendly and informal setting. This programme is not assessed or monitored. We want our pupils and junior members to feel able to make mistakes, learn and develop their skills in a supportive and secure environment. You will have a different pupil supervisor in each 6 months. Your pupil supervisor will oversee your professional development during pupillage and monitor your experience and progress with reference to the general and immigration pupillage checklists. They will also provide regular feedback on your work and be your first port of call for any issues that arise during pupillage. We will fund all of your compulsory pupillage courses, as well as some other relevant external courses, both during your pupillage year and beyond. We continually assess and monitor the progress of our pupils. However, we believe that the object of pupillage is to learn and develop skills in a friendly and supportive environment. To this end, we do not set competitive exercises. Rather, our dedicated HR Manager will discretely monitor your progress by obtaining feedback on your work from members of the team and your pupil supervisor. This feedback will then be discussed with you, both at scheduled appraisals and whenever a need arises, and we will work with you to address any areas of weakness or concern. The successful applicants will have a minimum of a 2:1 degree and be able to demonstrate academic excellence, a genuine interest in and firm commitment to working in the field of immigration law and an enthusiasm and aptitude for providing immigration law advice and representation directly to members of the public. Previous experience of working in immigration law is not mandatory, but will greatly assist in demonstrating the above. Please see the detailed selection criteria at the end of the application form. Applicants should apply using the Pupillage Application Form available on our website at www.richmondchambers.com. The application form must be completed electronically and emailed to nancy.holland@richmondchambers.com by 4pm on 10th February 2017. We will not accept hard copy applications or any other additional material. We will acknowledge all applications but, due to the high number of applications likely to be received, we will only correspond thereafter with applicants who are selected to progress to the next stage. At the next stage of the process, all candidates will be asked to complete a short written assessment. A selection of dates/times will be offered and candidates will be emailed the assessment at the start of their allocated time slot. Candidates will be asked to email their completed assessment papers back within a specified time on the same day. The assessment will involve issues of immigration law. The completed assessment papers will be reviewed and those applicants who show real potential in this area of law will be invited to attend an interview. We aim to conduct written assessments in the week of 27th February 2017 and interviews in the week of 6th March 2017. For any queries about your application for pupillage, please contact our HR manager, at nancy.holland@richmondchambers.com in the first instance.